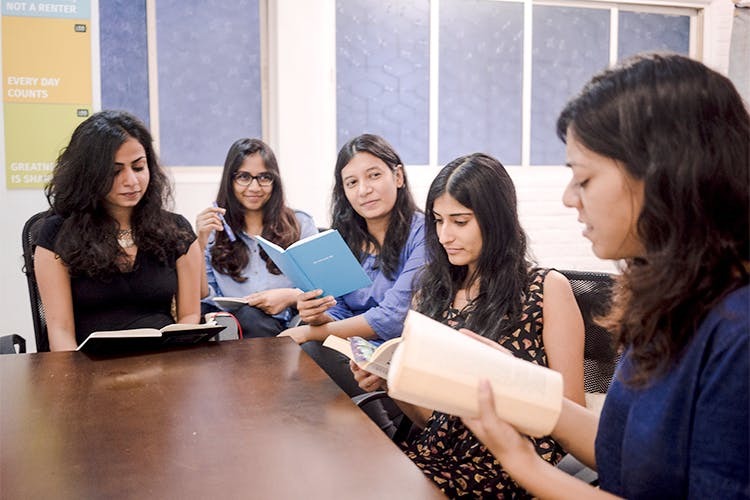 Ladies, get in formation and bring out book weapons to the line as Aqui from Bombay Underground Bookhouse and Dharavi Art Room has started off an informal Reading Women’s Book Club. Aqui has been involved with arts and books for as long as she could remember. After starting Dharavi Art Room and Underground Bookhouse along with her partner, Himanshu, she decided to start a reading women’s book club dedicated to female authors. A book club, or an informal meet up if you may, is in fact an art project by Aqui. The project involves women getting together, reading a book and then creating a piece of art inspired by that book. It can be a poem, a photography project, or even sketches. It’s open to your interpretation, and creativity. Aqui tells us, all of this will then be used to create a zine that will be showcased at a show on September 20 at What About Art?//. With book clubs and accounts on Instagram dedicating themselves to discussion on women authors, and more, this one comes as a breath of fresh air in Mumbai. There’s nothing more empowering and exciting than sitting with other women and discussing art, literature and women authors. Aqui has a reading list of 10 books – all written by women authors. Every 10 days, the group convenes at What About Art?// and discusses the book, their opinions and feelings. They’ve had Margaret Atwood’s The Handmaid’s Tale in the previous meet-up and will be discussing more. The list includes: Frankenstein by Mary Shelley, Fun Home by Alison Bechdel, A Room Of One’s Own by Virginia Woolf, Scum Manifesto by Valerie Solanis, The Colour Purple by Alice Walker, The Bell Jar by Sylvia Plath, Persepolis by Marjane Satrapi, The Bluest Eyes by Toni Morrission and Masooma by Ismat Chugtai. It’s open to everyone and anyone as long as they identify with the female gender – it is a ‘no bar’ meet up. We’re already picking up the book, and preparing ourselves for the next meet up because when the inspiration is around a corner in Bandra, we give in. The next meeting is happening on Sunday, August 6 at What About Art?//. Also On What About Art?